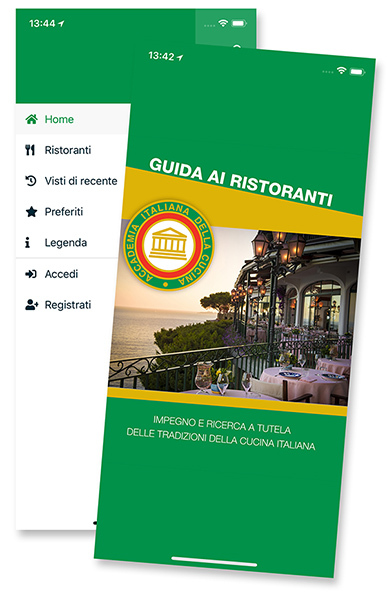 The Academy’s App Guida ai ristoranti (Restaurant Guide) has beengraphically and functionally updated. The application is structured identically on the IOS and Android platforms and in brief its main sections are: map, index, search, favourites, and recently viewed. The screen can therefore display the main restaurants recently viewed, one’s ‘favourites’, and the restaurants most recently added to the guide. The new, more user-friendly map tool can now display nearby restaurants as well as favourites, basic information on selected restaurants, and more detailed information if desired. The index has now been cross-referenced with the restaurants on the map and the search criteria (ratings, distance and price).